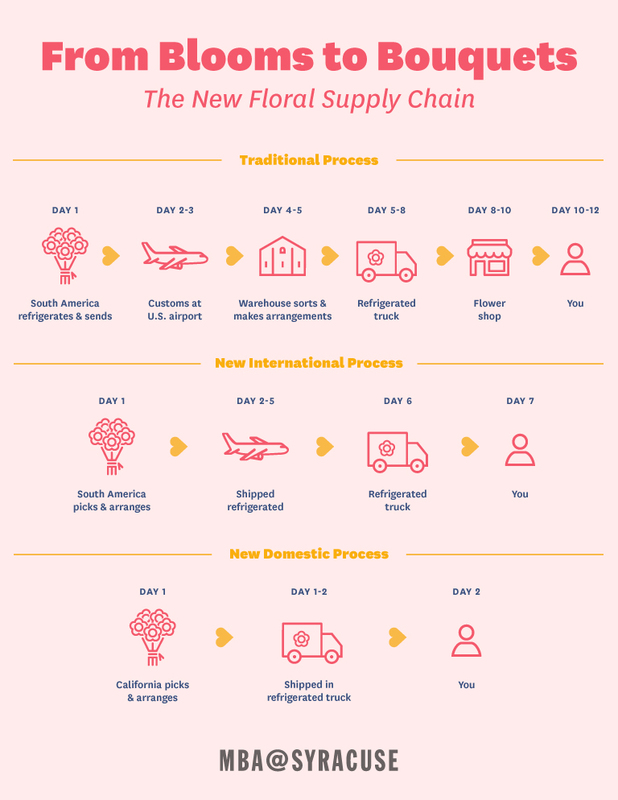 The Syracuse Online Business Blog recently published my article, “The Flower Supply Chain: Cold, Competitive, Consolidating,” with this infographic they designed to show how innovative players are shrinking the traditional paths that roses take from faraway farms to your Valentine’s Day vase. While researching this article, I discovered lots of things customers never think about when buying a bouquet of flowers, like how our national anti-drug policies have resulted in 78 percent of our cut flowers imports coming from one South American nation–Columbia. So many flowers–85 percent of all imported ones–pass through customs at Miami International Airport, it requires federal agents working around the clock in refrigerated warehouses to inspect for invasive insects and contraband. Despite faster and easier ordering made possible by the Internet and new supply chains, most customers–60 percent of customers for Valentine’s flowers are men–will wait until the last minute to order them. Hey, guys! It’s not that hard to remember–it’s always Feb. 14.